The search for a new web design firm is a challenging one, especially if you are running an ecommerce business. By redesigning your website, you risk downtime, system errors, customer confusion, and more. But the fact remains that when it’s time to update your website, you’ll need to choose someone to build it for you eventually. There are a variety of web design service structures out there now, with companies charging a flat rate, an hourly rate, and more. What you really need to look for in these companies, however, is that they have the flexibility and resources to understand your business goals, and perform all of the marketing activities that an ecommerce or other business website has to be capable of in order to succeed. Graphic Design. The proper designer knows that your website should look appealing, but also needs to be laid out in a way that improves customer trust and user experience. Custom Programming. Whether this is integrating design elements you would like, or the ability to make your back-end ecommerce function in a way that saves you time, your design firm should be able to provide customization. Responsive Design. This is the term of the year, and it means a website that reacts to how it’s being viewed – whether on a cell phone, tablet, or computer screen. A mobile-friendly website is no longer an optional service. A web design firm must be prepared to launch your website with responsive capability. Copywriting. A new website is a marketing tool, and if you aren’t much of a writer, your web design firm should have writers that can help with your website copy. On-Site Search Engine Optimization. This is no longer a service that can be separated from web design. 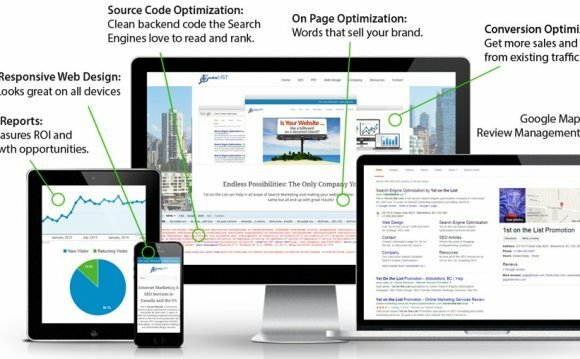 Your website designer should have a basic understanding of the website structure and coding factors that influence your visibility on search engines. If you are running a large ecommerce or business-to-business website, you may require services beyond the basics above. Instead, you may opt for a Digital Marketing service that can continue to keep your website active by marketing your company online and offline. Social Media Marketing. The level of social media marketing you need may vary. For some people, social media is simply part of running a business online! For many others, social media is a marketing function that isn’t in their skill set. A digital marketing company should be willing to do anything from provide basic training, to full management of social media accounts. Branding and Identity. Your company should be recognizable to anyone, anywhere. Your marketing firm should be able to help with branding and identity services, designing logos and imagery consistent with your company’s identity and attitude. Content Marketing. Companies of all sizes can benefit from a content marketing approach. This is a service that cannot be “one size fits all” – for some companies, it involves regular blogging, while for others, it may be a lengthy campaign surrounding an infographic, checklist and free ebook. Blogging. Speaking of content! Blogging is an incredible digital marketing tool – every new post is a combination of brand identity, prospect education, and search engine optimization. Your digital marketing company should be able to help you by providing guidance about blog topics, as well as offering copywriting services if needed. Email Marketing. After you start collecting contact information from interested visitors through your blogging and email marketing, you can take advantage of one of the most successful online marketing methods – email marketing. Depending on your business, there are a variety of tactics that a company can use with email marketing. For some companies, email marketing is about education and information, while for others, email marketing is a way to notify subscribers of promotions and new products. Search Engine Optimization and Analytics. A digital marketing firm invested in your success will have ways to know whether their efforts are having an impact in your search visibility and organic traffic. Search analytics tools allow companies to monitor where their traffic is coming from and the keywords that your website is ranking for, and makes marketing suggestions based on this information. A Listening Ear. A digital marketing company invested in your success is going to listen to your goals, business priorities, and what feels like the best fit for your company. They know that you own the roadmap to your company’s success, and view their role as partners in that, not just a vendor. In all, a customer focused website design firm is going to look a lot like a digital marketing firm, providing a full suite of services and capabilities in order to maximize a client’s success! If you want to know what that looks like in our office, give ATAK Interactive a call or email. If you’re local, we’ll invite you down to our office in the downtown Los Angeles Arts District. If you’re not local, not to worry – we’re experienced working with companies in other cities and countries. Austin is the Chief Marketing Officer at ATAK Interactive. His past experience includes work with the Tribune Company, DogVacay, and his former company, The Exacta Group, which was acquired by ATAK in 2014.